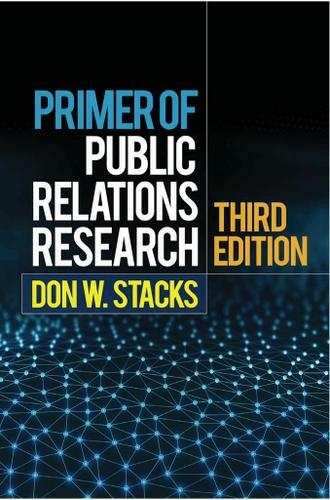 Thousands of public relations (PR) students and professionals have relied on this authoritative text to understand the key role of research in planning and evaluating PR campaigns. Revised and expanded to reflect today's emphasis on standards-based practice, the third edition has a heightened emphasis on setting baselines, creating benchmarks, and assessing progress. Stacks presents step-by-step guidelines for using a wide range of qualitative and quantitative methods to track output, outtakes, and outcomes, and shows how to present research findings clearly to clients. Every chapter features review questions and a compelling practice problem. PowerPoint slides for use in teaching are provided at the companion website. Instructors requesting a desk copy also receive a supplemental Instructor's Manual with a test bank, suggested readings, and case studies. New to This Edition: *Chapter on standardization, moving beyond the prior edition's focus on best practices. *Chapter on different types of data sets, with attention to the advantages and disadvantages of using Big Data. *Addresses the strategic use of key performance indicators. *Covers the latest content analysis software. Pedagogical Features: *Each chapter opens with a chapter overview and concludes with review questions. *End-of-chapter practice problems guide readers to implement what they have learned in a PR project. *Appendix provides a dictionary of public relations measurement and research terms. *Supplemental Instructor's Manual and PowerPoint slides.